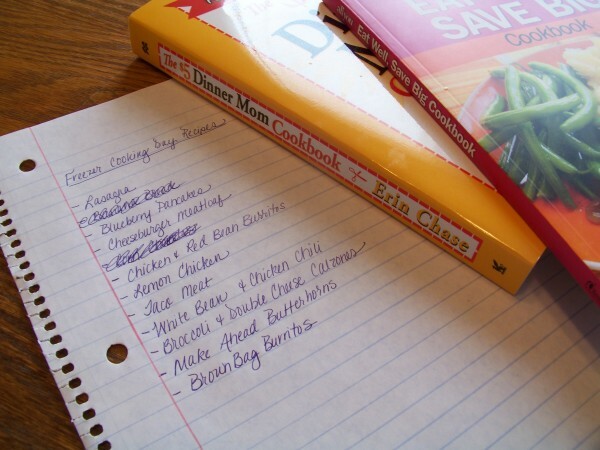 Jot down a list of ingredients you already have to work with and possible recipe ideas as you go along. If you have an odd assortment of ingredients and are stumped for ideas, check out the Ingredient Search feature on . 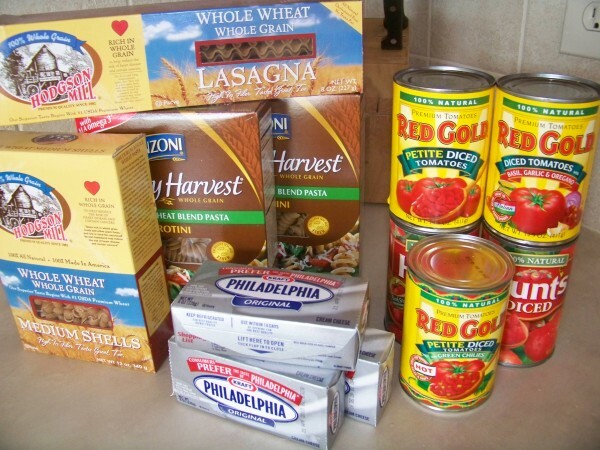 To give you an example, I went through my cupboards and freezer this morning and found the above ingredients: canned tomatoes, whole-wheat pasta, and cream cheese. I immediately remembered and added that to my list. 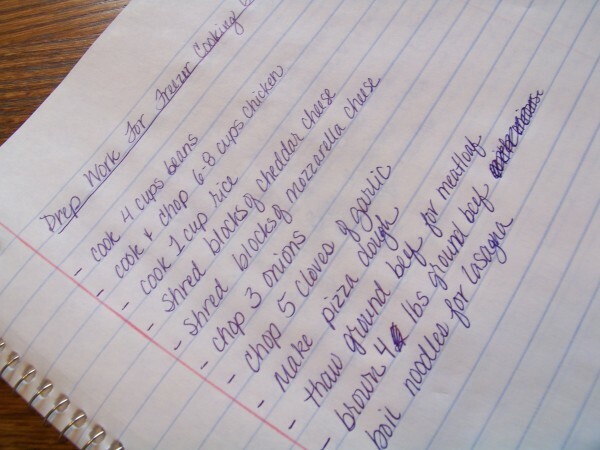 Take the recipe ideas you jotted down and narrow them down to 4-10 different final choices (or more, if you want to b!). Shoot for some variety in the main dishes you choose (I doubt you want to eat three weeks of nothing but chicken casserole!) and keep in mind how much time each will take. I usually try to pick a few simple meals and a few more time-intensive dishes. Just for fun, I asked to put together some free downloadable Freezer Cooking Planning Sheets which you are welcome to use, if you find them helpful. I’ve always used a simple notebook in the past, but I’m excited to finally have something a little snazzier to use. This simple worksheet has space for you to jot down ingredients you have on hand, recipe ideas, and ingredients you need to buy. Download the . This worksheet is a place for you to write down your final list of recipes, where they are located (cookbook, website link, etc. ), and all of the prep work each recipe requires. Download the . 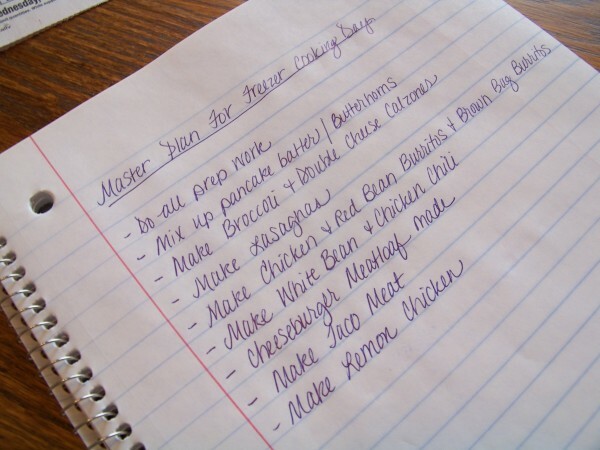 Once you’ve decided on your recipes, made your shopping list, and jotted down all the prep work each recipe requires, you can create your final list, the Freezer Cooking Day Prep List. This is where you’ll put the planned order of events for your Freezer Cooking Day. Check things off as you go and be encouraged by your progress and accomplishments! Download the . I’ll post my Freezer Cooking Day Master List and Prep List later on today along with a link-up for you to share yours, as well. I’m excited to get our very bare freezer filled up again! For more ideas on how to pull off a Freezer Cooking Day, be sure to stop by and read FishMama’s post called . Looking for more? Read more posts about Free Downloadables & Freezer Cooking. Here’s a website also to type in your ingredients to get good recipe’s it’s called bigoven.com hope this helps. I know there’s several site for this purpose. These are fantastic! I do something very similar but Joy’s downloads will be much nicer to use. I was thinking the same thing about the handwritten lists! I can only wish I wrote like that! Thanks for all the cooking planner worksheet downloads 🙂 I just printed them all. I will keep a copy in my folder in my filing cabinet that way I can copy them as needed. This was very helpful; thanks! Hopefully, I will be able to get even more in the freezer this month. These forms are so nice! I am trying to completely cook from scratch and realizing so many things need to be prepared before hand to make it run smoothly. I just soaked, pressure cooked, and froze 8 pounds of beans to use the next two months in my cooking so that task is never an issue. By doing this prep work on my own time, it was not stressful at all. I know this is a little ‘much’ for some people (including my husband) but when I am done with my grocery list draft, I rewrite it and put it in order of how the store is set up. This avoids me getting to the bottom of my list and having to make my way all the way to the back of the store to get something little I forgot. It saves me time and a ton of aggravation. @amy, I do that too! My husband said my OCD was getting out of control. But it’s so much easier in the grocery store. Especially if you’ve got kids with you. I always have at least one with me. @amy, I do the same thing.I have four children and this method saves my sanity when the store is busy and the children are cranky. OOOH!!! Too good Diana, thanks!!! Will do! I do that too! It really helps, especially in big stores like Super-Walmart. @amy, My husband doesn’t mind that I put the list in order, he is more worried that I know the store layout by heart! I have a form with columns labeled by the number and items in the aisles of the store. I use that to make out my grocery list. My coupon book – a regular binder – has the list of items of each aisle by number. I put this sheet in a document protector and put my coupons behind the sheet. As I pull out coupons I just put them in the front pocket of the binder to hand to the cashier. A very big thank you. I was just discussing (bemoaning) with a friend that what my biggest obstacle to overcome (besides homeschool burnout and lots of other stuff) is planning. Or lack of planning. So thanks for the tips, the step-by-step ideas & of course the downloadable free forms – always love that! @Ellen, Just an added note… it’s funny how my brain is nowhere to be found right now …in the past, I catered several weddings (from the planning to buying to making to decorating to serving) & incorporated many of these step-by-step ideas. Somehow then I was able to manage it (had to, I guess…don’t want to disappoint the bride & groom & all the guests), but now… it’s like I’ve checked my brain at the door since having kids! Awesome – thanks for sharing this!!! Thanks so much for this post… it will help me so much in my organization plan for my first ever freezer cooking day… I’ve actually started doing a little prep already… last night we had baked chicken for supper so I went a head and baked an entire bag of leg quarters for shredding and froze them in sections for three different meals. Plus 2 nights ago we had beans and rice and I froze the leftovers in 2 cup portions. I’m so excited! My plan is to master freezer cooking in the next 2 months so I can do an all out freezer cooking day in May before the arrival of my little one. Wish me luck! Thanks for sharing. I really need to do this. I just can’t get over how organized you are. What an inspiration!! I’ve never attempted a Freezer Cooking Day, but this post lays it out so neatly that I’m going to do it. Thanks a bunch! This is brilliant! Thanks for breaking it down so clearly for us! I love it! and the worksheet! Cheers! Thank you so much for this! I have been wanting to do freezer cooking, I just did not know where to start! I am going to start small and double a few of my recipes for March, since we only have a little freezer and it is running out of room! Then I hope for April I can plan and cook for the whole month. I was wondering how many nights do you have a cooked meal for your family? Do you cook a meal for every night or just the ones you know you will be able to be home? We usually have a cooked dinner at home 4-5 nights per week. We usually eat dinner with extended family twice a week and we eat out once per week. Thanks so much!! I am looking forward to trying freezer cooking for the first time in the next couple of months. This is just what I needed to get started! Tank you, thank you, thank you. I have been wanting to try freezer cooking so badly, but did not know where to start. I will be documenting my new adventures on my blog, pictures and all. Should be interesting. Thank you so much! I hope to participate a little this month, but these forms will be fun to try out! I like that even before the forms, you did so much with a simple spiral notebook :). Thanks for all the tips and print-outs. We’re buying our first house and plan on moving in a month, So money will be tight (you know all the little things that ad up when you move). I cant wait to do a freezer cooking day just after we move, it will help me get acquainted w/ my new kitchen and new big freezer my mom is giving us. Love, Love, LOVE the organizers! Thanks for sharing! I can’t remember the name of the author but there is a book I used to use called “Once A Month Cooking”. It was a great resource – my sister borrowed it and then accidentally sold it at a garage sale! I love planning things, making lists, and being organized (although it doesn’t always happen!) so I was thrilled to print out your new forms! Thanks so much for a great post- very helpful! Thanks Crystal! These forms should help a lot. Seems like I’ve had a severe case of “Mommy Brain” the last while, and any list that helps me to be sure I’ve got it together really helps! Maybe this time I’ll actually DO everything on my list! @Rachel, Crystal, something I just noticed . . . your prep list says “boil noodles for Lasagna” Did you know that you can layer the noodles in your lasagna WITHOUT cooking them, and they will cook just fine when you bake it? I try to make sure the top layer is pretty much completely covered with sauce – but I would do that anyhow! – and it has turned out great time and again! Happy cooking! This post couldn’t come at a more perfect time!! I am 36 weeks pregnant with my third and next weekend me and my best friend are sending our kids out with Dad’s and doing an all day freezer meal cooking day!! I am somewhat organized but this helped even more! I would really love to know you go about freezing your food. What containers do you use, and how do thaw it? I would love to start doing this but cannot seem to get the info I need. Thanks for all your hard work! I’m excited to start doing this! I really appreciate you sharing! You are totally organized!! Would you consider sharing any of your recipes that you had on your paper? They sounds AWESOME!! Thanks again. I’ll be sharing all of the recipes on Monday and Tuesday. Stay tuned! Thank you for sharing! But does anyone have any rules of thumb for recipes that are good for freezing? I’ve tried a couple without very good results. Is there anything you never cook ahead and freeze? If you have an iPhone or iPod Touch you can also download the Betty Crocker kitchen assistant. For those who only have a computer there’s an app for that as well called “Betty Crocker Kitchen Assistant”. I was thinking of trying this out. Sounds like a great plan. I’m concerned about freezer space! I’ve only got one freezer in my fridge, no deep freezers. I feel like there’d be no room for veggies, frozen lunches, etc. How much room do you need? Maybe I should just do two weeks of meals at a time? I like your shopping list with lines! Easy way to do it! When I was pregnant with my daughter, I did a huge freezer cooking day. My method worked so well! I used my pressure cooker, and all the recipes were complete meals (protein, starch, and veggie together.) While one meal was in the pressure cooker, I prepped the next one. I packaged the last meal, wiped out the cooker, and tossed in the next ingredients. I got 10 meals done in 8 hours, 2 more in the crock pot, and my kitchen was clean at the end of the day – just a few prep bowls, the pressure cooker, crockpot, cutting board, spoon and knife. I froze the meals flat in freezer bags, labeled the fronts, and they stacked neatly in the freezer. I should do that again! I’ve also done “dump chicken” in the freezer – putting raw chicken and the freezer bag with the seasonings. I don’t like the name “dump chicken” but that’s what I’ve seen it called. Meatballs are another big batch that I’ve done with success. I found a page called Meatball Mania with recipes using meatballs. It makes dinner prep so fast and easy! Thanks for the tips! I want to master freezer cooking, too. I noticed you had on your list, ‘boil lasagna noodles’. A time saving trick that I recently learned is to put my lasagna noodles in the baking dish and fill it with hot tap water. While I cook the meat sauce and whip up the cheese filling, the noodles will soften enough to use in the lasagna. Just drain the noodles and construct your lasagna. It works best if the lasagna will sit overnight (or freeze) because it gives the noodles a chance to soak up the juices. I LOVE this trick. No longer do I have to deal with hot, split lasagna noodles!!! Hi – this has nothing to do with freezer day plans – but I just realized that one of the things I really like about your blog is your photography. Your kids are so adorable that it’s hard to notice anything else about the photograph, but I realized today that you make even a handwritten list and a couple books look artful. I notice you always shred your own cheese. At one of the stores where I shop, I can get an 8oz block of cheese for the same price I can get a 8oz bag of shredded cheese ($1), so I have always opted to get the pre-shredded for recipes to save myself the work. I want to get the most for my money so I was wondering, am I missing something here? Thanks for this. I’m looking to do my first freezer cooking day(s) later next week. Honestly, I’m a little nervous but know we need to do it. I appreciate all the info on how you plan yours! This is the best written article on starting freezer cooking I’ve seen. All the others just made it sound like way too much work! I’m going to make just a couple tomorrow to get my feet wet with some whole chickens. You inspired me. Thanks! I Just posted what I’m planning so far on my blog….can’t wait! I too would like to freezer plan but also wonder what containers you use for what meals…like lasagna frozen meal. Thank you for your wonderful tips! Do you freeze any recipe or are there certain tried and true ones you prepare this way? Crystal, you’re post is inspiring me to plan better. Just last week I had two huge but separate cook-ups of minestrone and ratatouille. (We’re currently in the middle of a zucchini, eggplant and capsicum glut from our vegetable garden.) If I’d done those together it would have saved me hours. The step where you list the prep steps then combine them before you assemble the dishes seems obvious, but although I do that for dinner parties I hadn’t thought to apply it elsewhere. 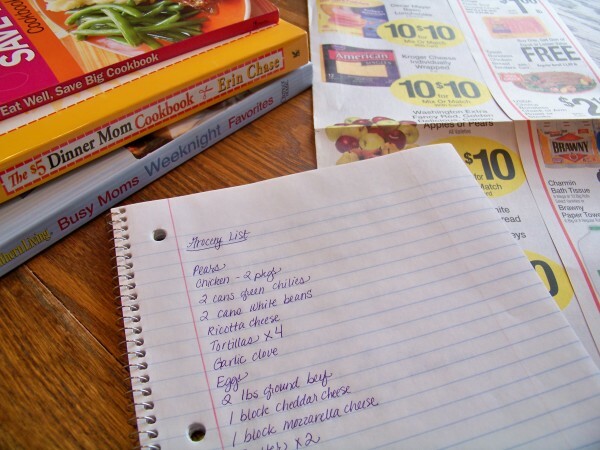 Now I’m off to check out your grocery planning tips …. Freezer cooking is a wonderful tool that I need to utilize more. One of my friends does a quarterly freezer cooking that I need to do. I have done this a few times and I really like how Crystal outlines it so well here and in her ebook. I’m planning on freezer cooking soon! These look so helpful! Thank you.